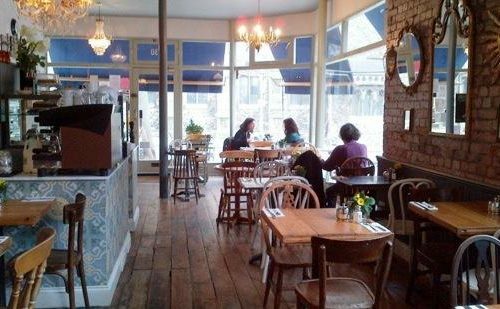 Blue Legume is a breakfast and brunch institution. The breakfasts are super – eggs any which way, Mediterranean dishes, vegetarian options or full-on carnivore platters of goodness to set you up for a busy day or soak up that accidental hangover. The doors are bursting with banter and and the interior is full of food-piled plates – this is one popular restaurant. Bare brick walls meets a little antiquing and a bit of quirk with a light-infusing fondness for old mirrors, punctuated by some funky art. The staff are speedy, cheery and bustle around efficiently to fulfil your needs. Less well-known is the eclectic, inventive, homemade evening fare. From roast salmon with beetroot coulis and a whole baked goats cheese to chicken & tarragon risotto or superb chorizo & halloumi salad. There’s burgers, pasta, prawns and more. But we’re slightly obsessed with their beetroot mash side dish and have taken to having it with everything we order!